"Amen. It's as simple as that." "When the evangelist that led me to the Lord asked me to read this verse out loud & then answer, it broke me! I trusted Christ that night, 40 yrs ago. Praise His name. I did not accept Him, He accepted me!! I was accepted in the beloved!" "Amen a very very true"
"It's just that simple! :)"
"Religion-0, Jesus-1. Take that, religion." "Simple. Nothing hard to understand about that scripture. Praise the Lord! Praise the Lord!" "Exact thought...as simple as that." "Praise GOD.. for His Unconditional Love toward mankind.."
"So very glad to have found the Life....."
"THANKFUL I have life in HIS SON"
"That sums it real simple! Amen"
"These words are straight to the point, No Son No Life......Amen!" "Amen Lord m inviting u in my Lyf nid u." "Brief, to the point and easy to understand." "But the wrath of God abideth on him (John 3.36) - Come to Jesus for life abundant." "Cheer up brethens the word workz"
"Gods word and his beauty !" "I am 101% believe in this words of God!" "I have LIFE! The LORD makes me into something worth so much more! *<3*<3*<3* praise you JESUS!!!!!!! :) I love Him"
"In other words, if you KNOW where you came from (the Son of God--the Christ of God) in the beginning, you KNOW you have eternal life within you; if you don't know who or whose you are, you will think yourself lost and alienated from the Father. Jesus came to show/manifest to us the Father, and who we are IN CHRIST. 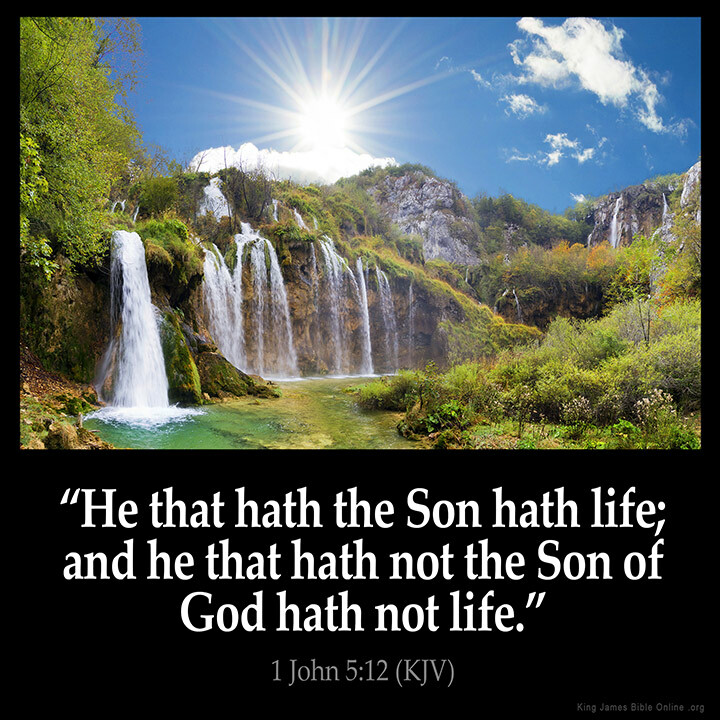 Selah"
"No Jesus,No Life....because He is life Himself, all that live for God will receive life eternal...Lord in You i live,in You i move,in You i have my being.....!!" "Plain and Simple. LOVE IT." "Praying for our brothers & sisters in Christ for those in the Phillipines MERCY be His will"
"Romans 10:9 "That if you confess with your mouth that Jesus is the son of GOD, and GOD raised HIM from the dead in 3 days, you will be saved!" --- I LOVE that scripture! :D"
"So choose today, now, whom you will serve. We see the evidence daily how our God will come swiftly. Only taking all those who his father has given him. Look at the meteors in the sky; a sign that our Lord is near to the doors indeed. Get down and pray to the heavenly Father for forgiveness of Sins." "So clear & simple! :)"
"The life of God is in me, glory to God"
"This is the REAL bottom line. All hail King Jesus!" "Wonderful promise to his children!!"